The Truglins™ are an adorable unique set of character stickers designed to make Rainbow Trugs even more fun and appealing. Initially aimed at encouraging children in to gardening or keeping their toys tidy, we find that a lot of adults are buying and enjoying their company too! Why not collect the full set of characters and own a whole family of fabulous Truglins. No home, garden, workplace or school should be without a Truglin™ as they are so entertaining to have around and extremely helpful too. Justin Credible – The super hero of the trug world! Made from a strong, flexible, food grade material, he loves nothing more than to flex his robust handles and durable body. Lady Iris – The Greek goddess of Rainbows. Known for her love of colour, Iris can match your personal colour scheme and help to brighten your world. Ivor Lottin – Certainly lives up to his name. With his huge capacity and thick sidewalls, Ivor Lottin will hold more than you think! Phil Me-Up – The party host with the most! Made from a quality food grade material, Phil Me-Up has a huge appetite for tasty treats and party snacks. Seymour Smiles – The happiest trug around. Guaranteed to bring a smile to anyone’s face, Seymour Smiles is always happy to help. As well as The Truglins™, we have also created some simple Trug Stickers including a robot, a teddy and princess. Stickers labelled SMALL are the perfect size for our 2.2 litre Mini-Tub® and 25 litre shallow Rainbow Trug. They also work well on our 14 litre trugs. Our LARGE Stickers are ideal for our 14 litre, 30 litre, 45 litre and 75 litre Rainbow Trugs®. We have produced these stickers to adhere to Rainbow Trugs® and cannot guarantee their adhesion to other manufacturers products or different materials. *Please Note: Stickers are sold separately and the Trug is NOT included. 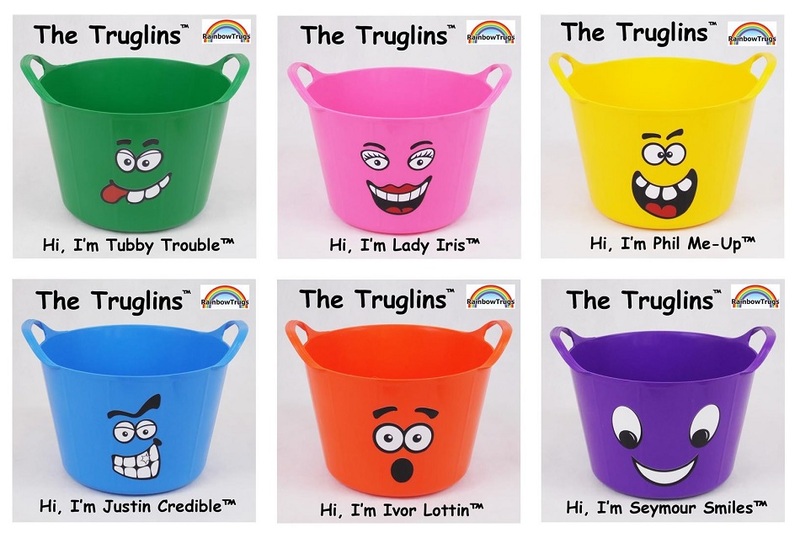 The Truglins™ are a unique set of character stickers designed to make Rainbow Trugs even more fun and appealing.